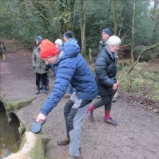 Guests at Speech House were treated to a Boxing Day walk. They viewed the oaks around Speech House, planted and dedicated to various members of the royal family, they admired a well-loved stained glass work called Cathedral, they visited Woorgreens Lake which was formed by open cast coal mining. But the highlight of the walk was a visit to the Woorgreens Nature Reserve, developed by the Gloucestershire Wildlife Trust. This is an enclosed area of wild grasses, heathers, gorse, hardy trees, and a variety of wildlife. Insects and birds thrive in the area. Unfortunately the resident English longhorn cattle had just been moved on. 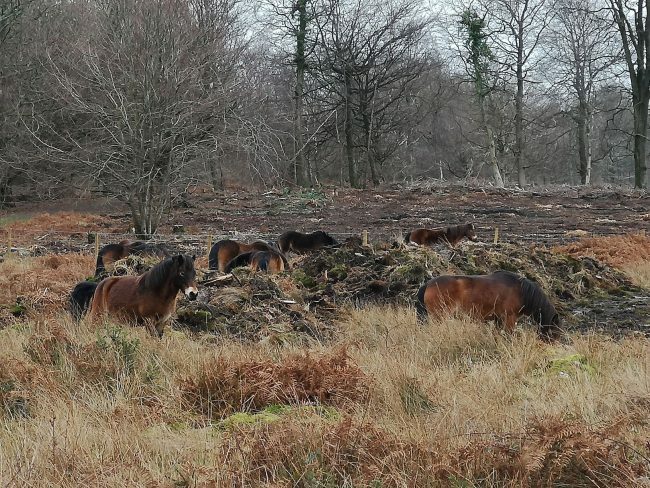 However the walkers were able to view the charming Exmoor ponies who act as a natural lawn mower. One of the walkers who lives locally has contributed a photo. If you want to see the ponies, don’t put it off too long. They will be moved along to another site sometime in the spring. Christmas guests at Speech House enjoyed much more than a lavish dinner. Guests were invited to put on their boots and join a Xmas morning with with a Forest of Dean & Wye Valley Tour guide. Using Spruce Ride as a base, the walk zigged and zagged back and forth, taking in Speech House Lake, Reform Bridge, the disused railway path, and peeking into the Cyril Hart Arboretum. Besides the growing spruces, walkers saw abundant Douglas Firs, beech trees, Scots pines, birches, and the mighty oak trees for which the Forest of Dean is famous. Walkers got back to Speech House in time to don their glad rags and feast on canapes and cocktails. Not bad! Walker trying to control his dog! Walkers in the Forest of Dean are used to finding Forest Rocks — small rocks decorated and left in obscure places to be found and enjoyed by anybody passing. A Forest of Dean guide was checking footpaths for a walk from Speech House that was to cover Woorgreen’s Nature Reserve and Woorgreen’s Lake. 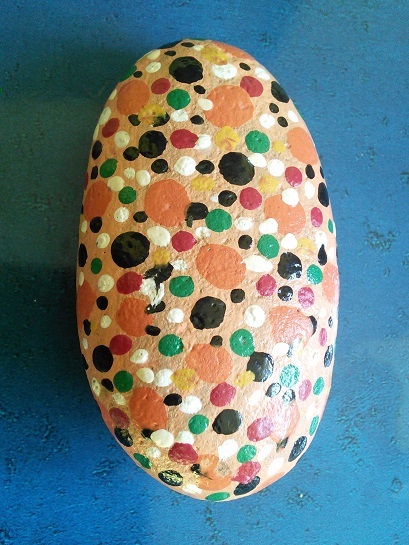 The guide found such a rock near the beloved stained glass window, Cathedral, part of the Sculpture Trail. However when examined, it turned out to be an Oregon Traveling Rock! Somehow the rock had traveled many thousands of miles. We can only imagine what it has experienced along the way.